This is a work in progress I thought would interest members here. 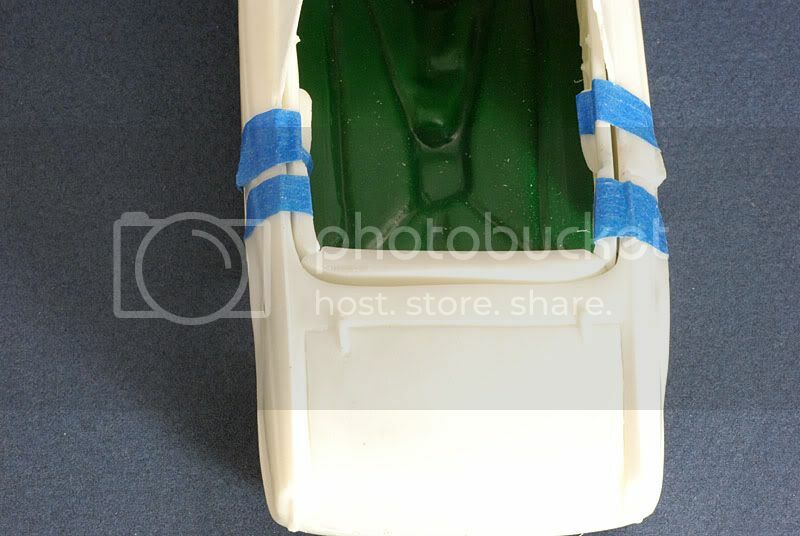 It's work adapting a resin body to a donor kit and has many challenges along the way. 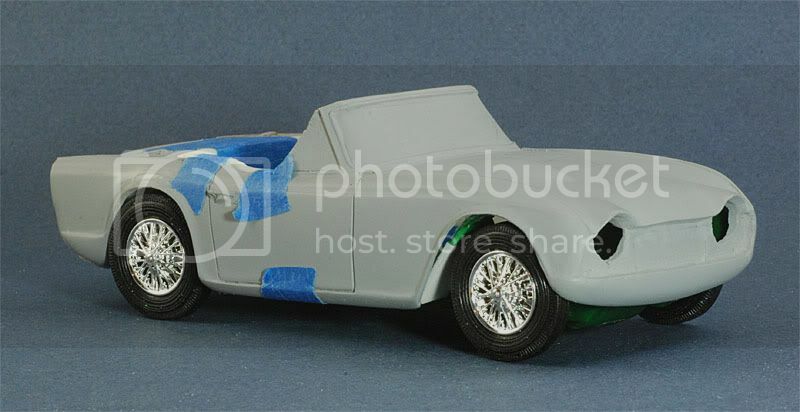 This is a build of the 1967 TR4A I had when I exited the Army in 1969. 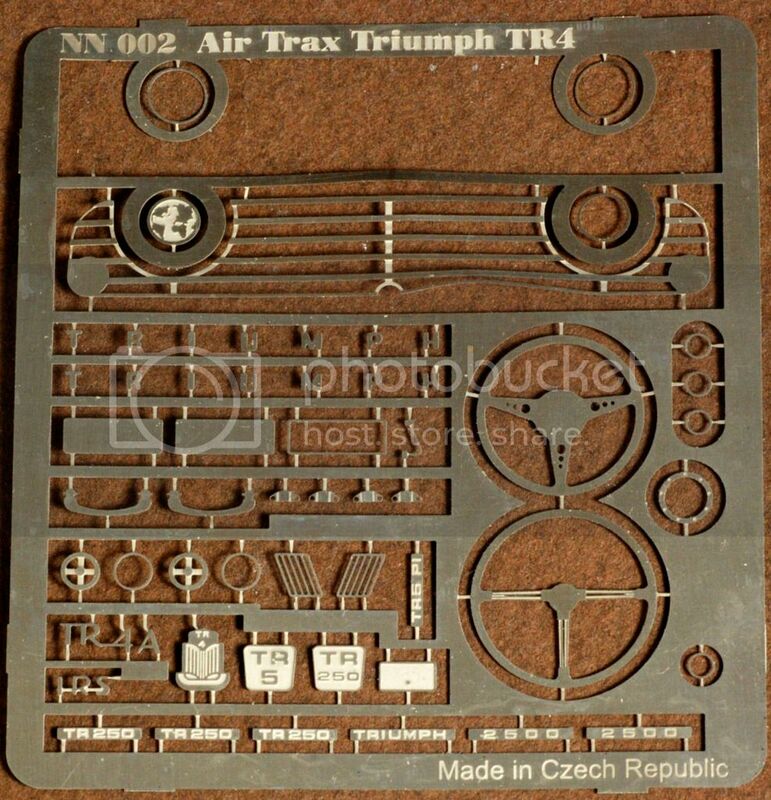 I have an Airfix TR4A kit which is pretty detailed for a 1/32 model including a full engine. But, I'm a scale tyrant and I like all the builds on my shelf to match, so 1/25 - 1/24 is my preference. 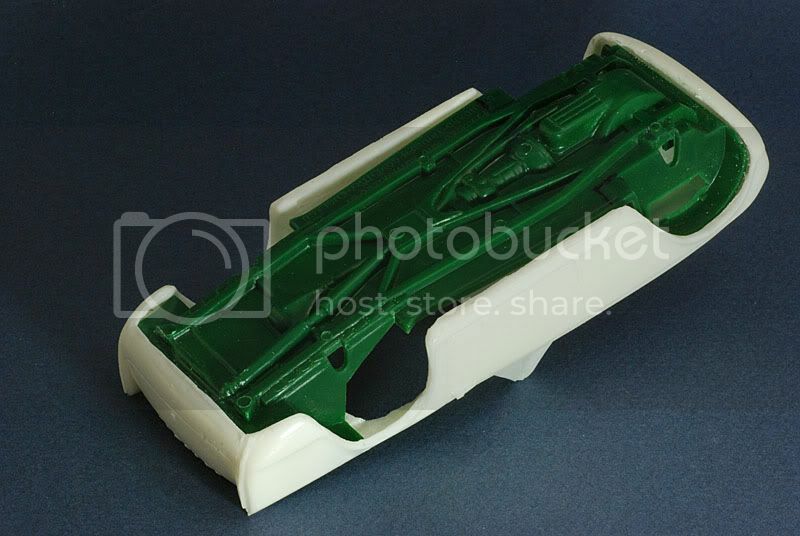 Therefore I picked up the Air-Trax TR4 resin kit. 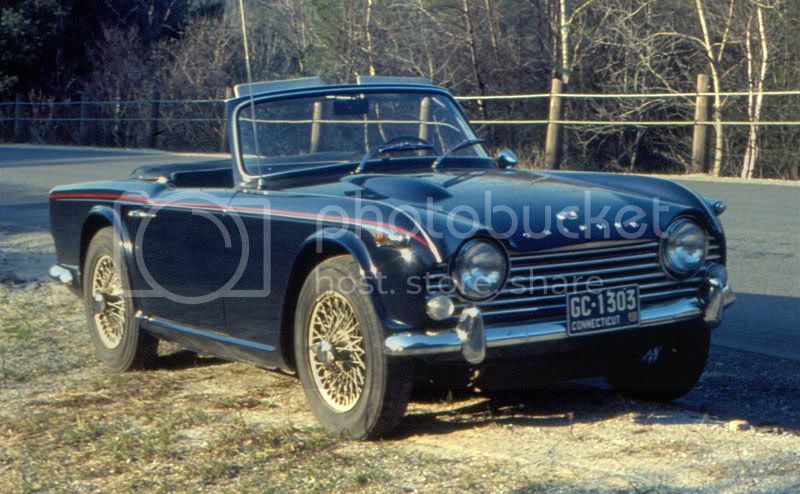 A Gunze Sangyo Triumph TR3 is the recommended donor kit and the Minicraft 1958 Triumph TR3A kit is mentioned as another possible donor. I have both kits so will show a bit of both and how I decided which to use. So here's a few shots of my 1:1 to start. 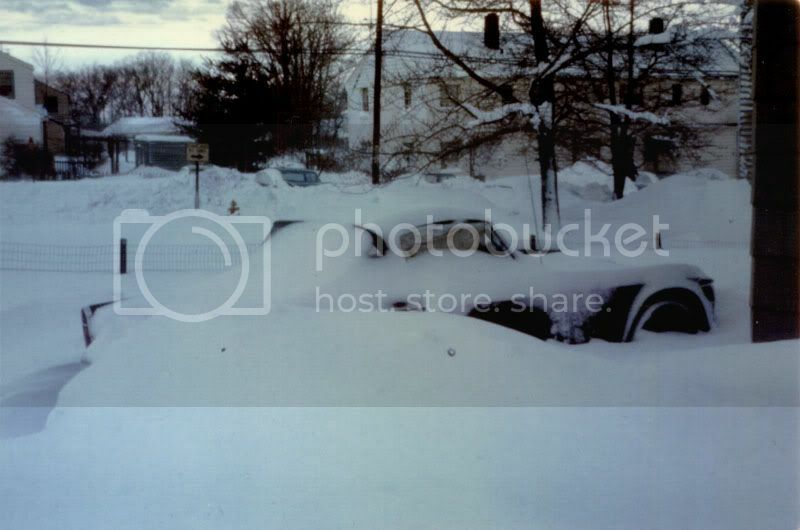 I drove it all year as I was stationed about a hour and half away at Ft. Devens, MA waiting for my Medical Discharge. Just throw some chains on for those bad days. 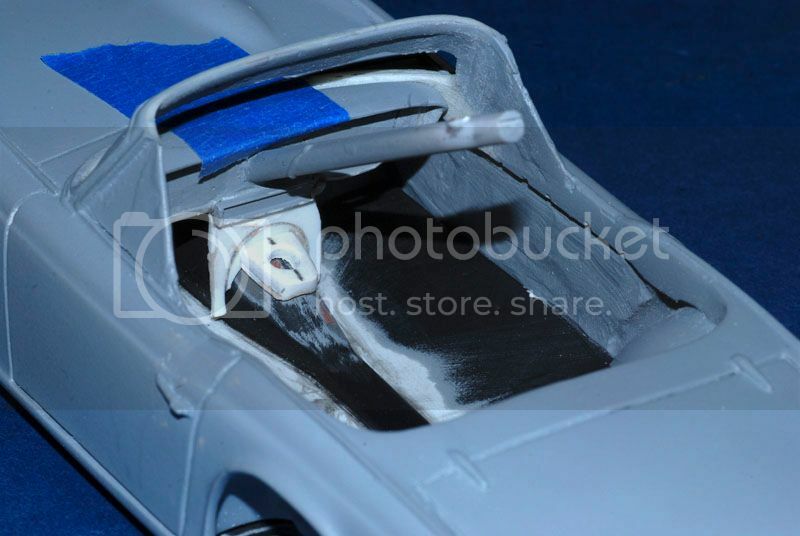 The Air-Trax body is pretty thick and needed some grinding to fit the "frame/wheel wells" from the donor kits. 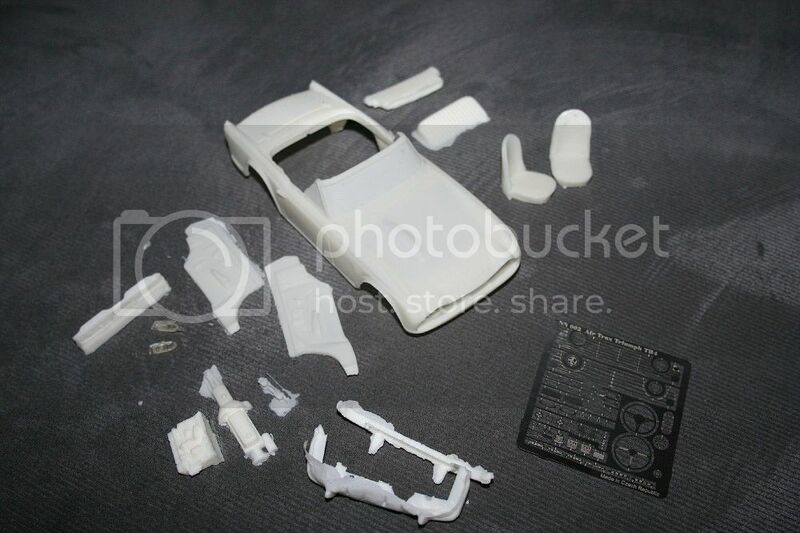 The Gunze kit has the floor pan molded separately needing the firewall and front wheel wells added. I glued them with superglue so I could test fit. Below is the body and a couple shots after grinding. The Minicraft frame is all one piece and I like how it fits. I cut about an eight of an inch off the back and cut it flush to the wheel wells at the front. I think this one is gonna be the keeper for the build. The rear of the front wheel wells needs to be rebuilt to slope backwards to match the body openings. A lot more grinding and fitting today, mostly on the interior panels as the frame is fitting well. I will need to make a floor, hopefully the Minicraft TR3 floor will work with some mods. 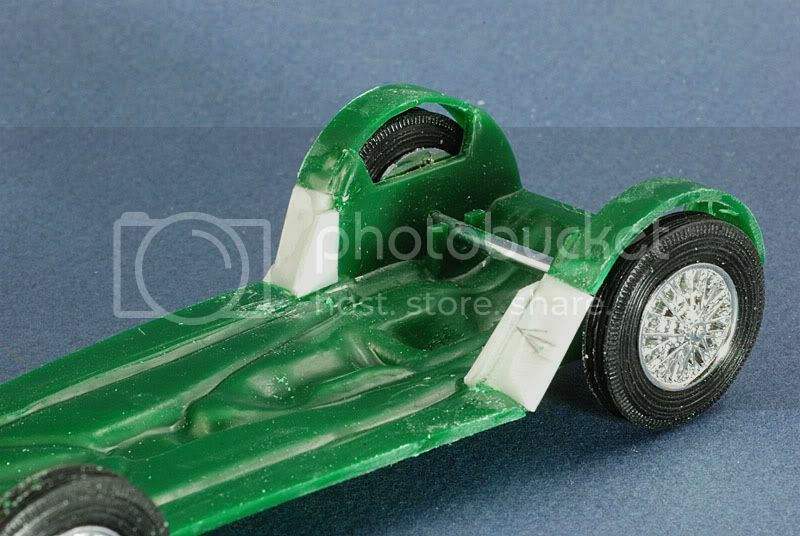 The need for reshaping of the rear of the wheel wells can be seen in this photo. 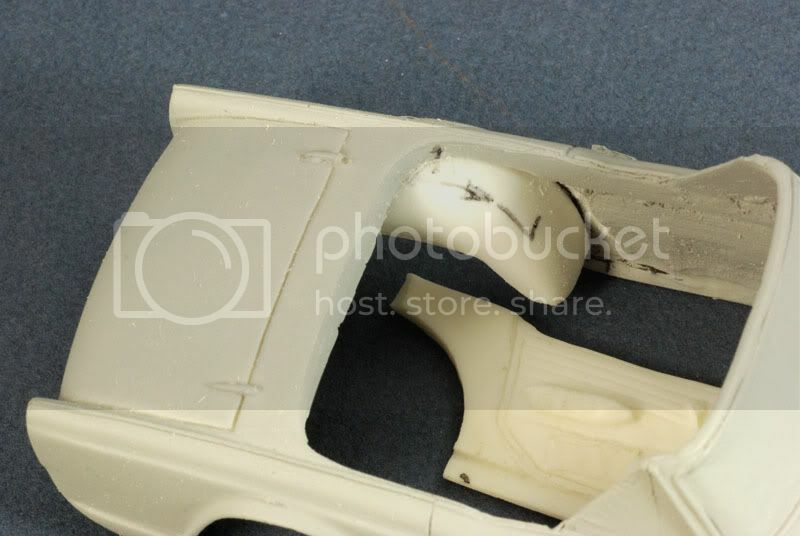 This is due to the difference in shape for the TR4 and TR3 wheel openings. It should only need some trimming and added sheet plastic to get the slope. The interior panels need considerable sanding to get a fit along the body edges. The photo gives an idea of the work required and much more needed. I will have to make a tonneau cover for the top so most of the edges won't be seen and I can ease up on this a bit. I wonder if some kit has something I could adopt for the tonneau cover? The bottom edge of the trunk was really a mess with holes spaced along the edge. 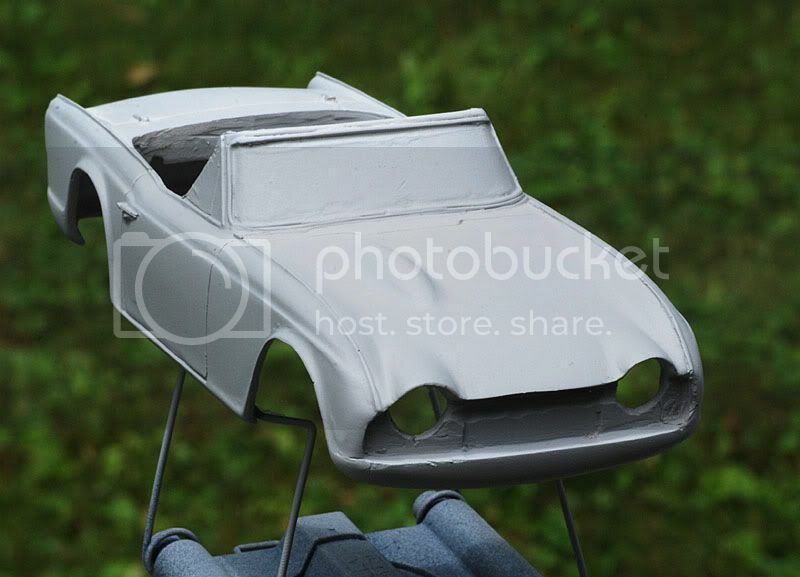 I did some putty on it and scraped the line but most of the putty came out before the primer coat to check things. I may have to fill the whole thing and re-scribe a new line. I also did more grinding on the body edges and wheel wells thinning to less than half the original thickness. 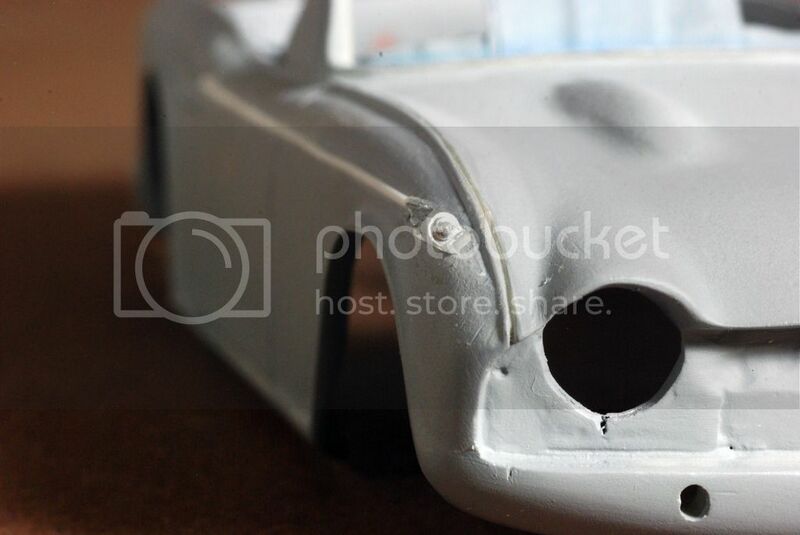 The front grill area needs shaping with putty on the driver's side to proper shape. I will have to create the rear wheel wells that intrude on the interior. 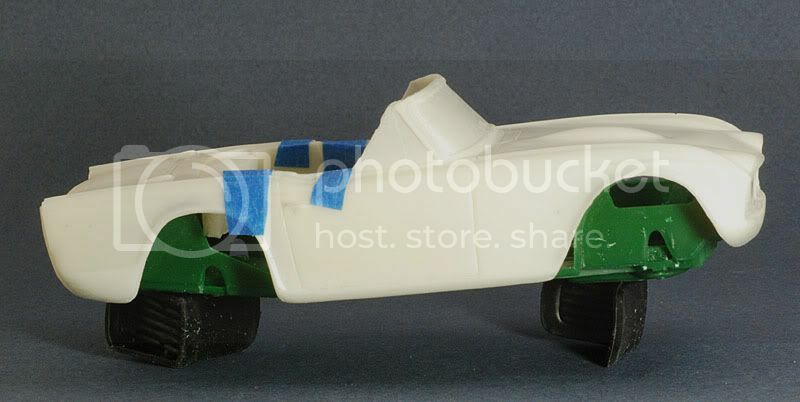 The rear and side pieces that come with the kit are contoured to fit around them but neither TR3 donor kit has these sections of wheel well with them. 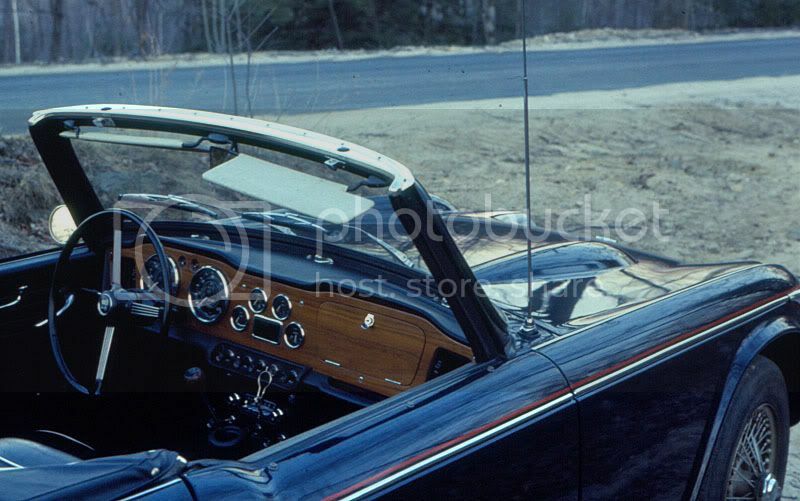 The TR3's use separate interior pieces that are not correct for a TR4. 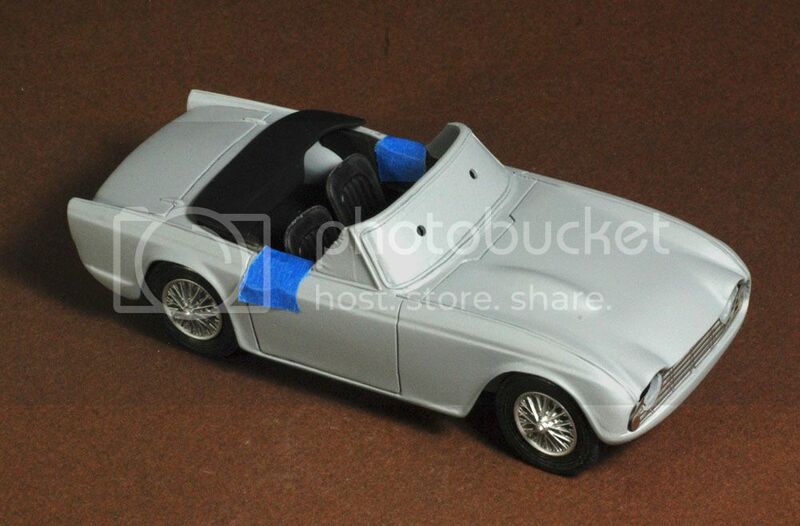 As a whole the body is good but it is very thick and the areas mentioned need bodywork to bring back the shape. I wouldn't recommend this one to a beginner. 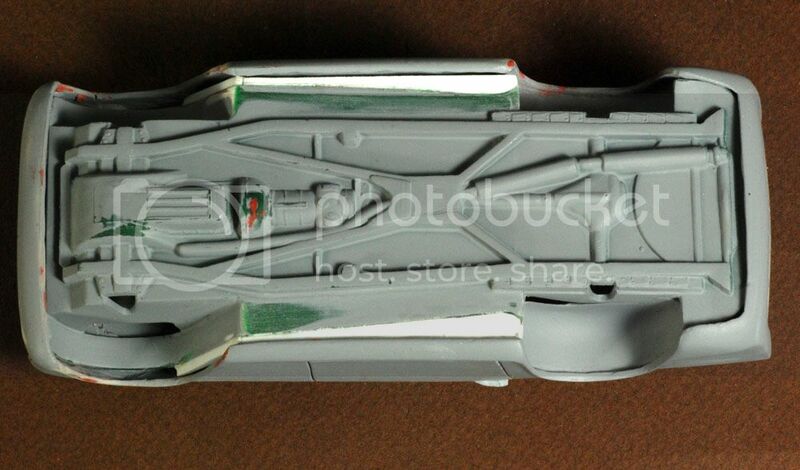 I believe the later body's by Air-Trax are much higher quality. This needed rear wheel wells as they show in the interior. The donor frame has only the rear portion of the rear wheels. I cut the rear wheel wells off the frame of a '51 Chevy convertible that was already being used as a parts car. I also took the convertible boot to cut down and possibly use if I cant find another. After they were fitted and glues to the body the donor frame wheel wells were cut down to match. Not a perfect match, but when painted black they will be hardly noticeable. It took more grinding to thin the body more where the wheel wells fit and I did the final thinning and smoothing and thinning of the edges around the wheel openings. The back slope of the front wheel wells was sloped rearwards to get it behind the body. The donor TR3 has straight sides on the wheel openings. 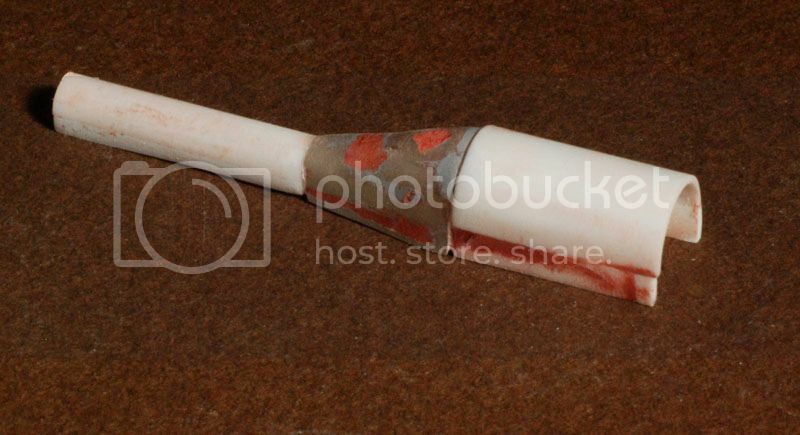 I just cut the corner out and added .06" sheet plastic epoxied in place. final finish sanding hasn't been done yet. The frame was fit better and the wheels now look better centered. Continuing to patch small areas on the body as they show up under primer. The bottom of the trunk lid is getting there .. I think it is very close now and will see with some more primer. There are some panel lines still needing the scribers to define better for applying BMF first. 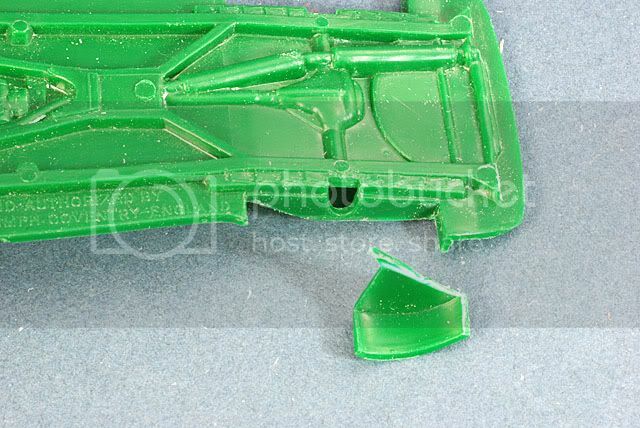 I want to document well what it takes to get this very early Air-Trax TR4 resin kit up to snuff. So excuse all the photos with little change. Be assured their newer bodies are VERY good! The TR3 chassis had some .06" widening pieces epoxied on with glass cloth reinforcement. It fits really well now. 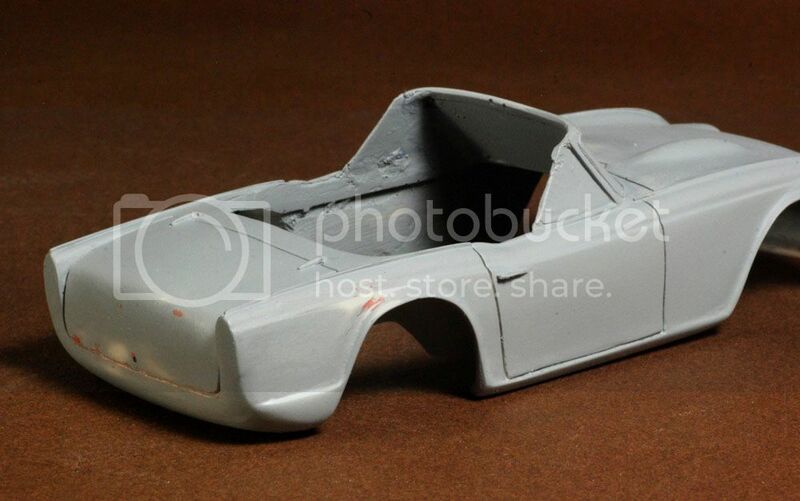 Next step is to get the stance right now that the chassis is a drop in fit. I needed a transmission tunnel and found the one in the Gunze TR3 kit to be the perfect size but I didn't want to cut up that kit. 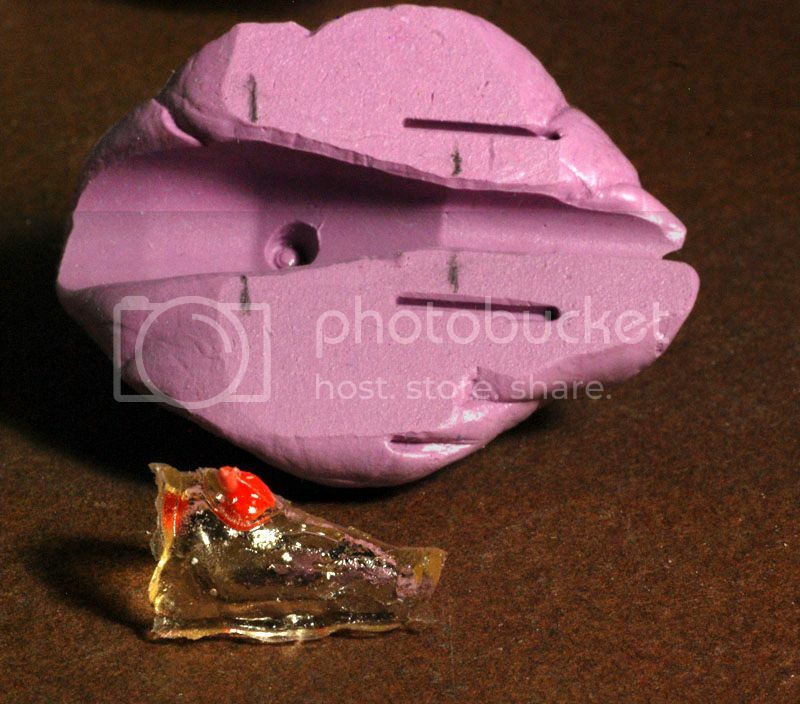 After considering a few ways to make it I made a mold with silicone rubber and made a casting with Bondic. This material is a clear plastic that cures in 4 seconds under a blue light. It all worked out well and now the interior is coming together! 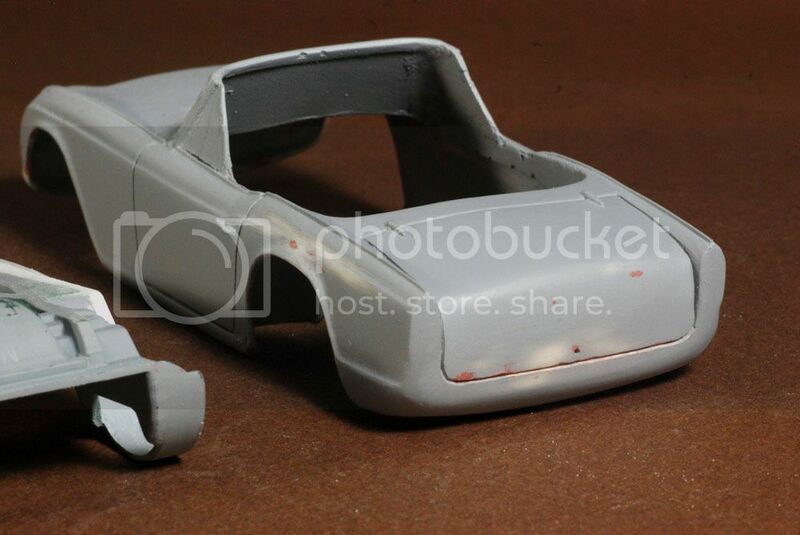 Got a mockup with primer .. bodywork is done ... this was a long road to this point! Thinning the resin body and panel line repairs were the most time consuming but all the TR4 things are well done and it just needs the TR4A specific side chrome and side light assembly to be made. I popped the PE grill in that came with the kit. The wheels are in Metalizer Stainless Steel and maybe too shiny, the wires were only painted. The interior pieced are in black primer and the top boot is made but only taped in place and not laying flat. 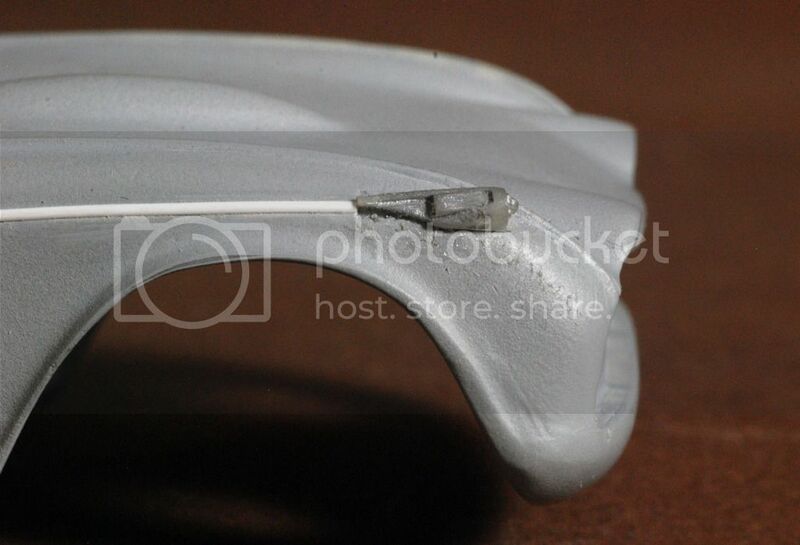 It will have the piece attached to the front edge that hangs down .. not sure of the purpose of this loose flap. This is the dash with a low resolution print of some dash wood .. needs sone more irregular grain I think. The dash proper is set but the center console had to be done from scratch and is still being shaped .. at least the fit is correct now. Kit Basher has generously sent me some wood veneer for my dash and this is in the process. It is so thin I was considering using the veneer itself but have photographed it and will use a photographic print. Maybe in next update if that works. The veneer he sent has beautiful grain .. perfect for my dash. 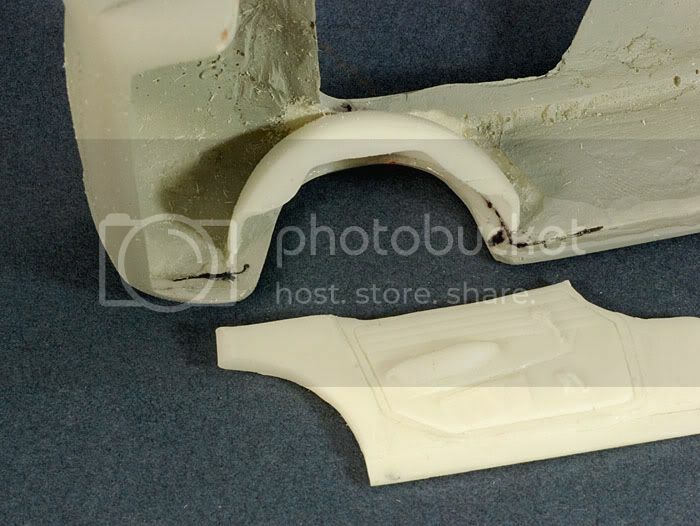 In this photo is the rear resin bumper that broke in two places due to my clutzy hands while sanding the flash off. They are pinned and ready for glue, but this joint will be delicate no matter what. The rear bumper has the mounting pins in place and is ready for Alclad. The center console has a piece added because I had to lower the center tunnel to correct the console height .. I hope I can get a radio in it after adding the shifter piece. 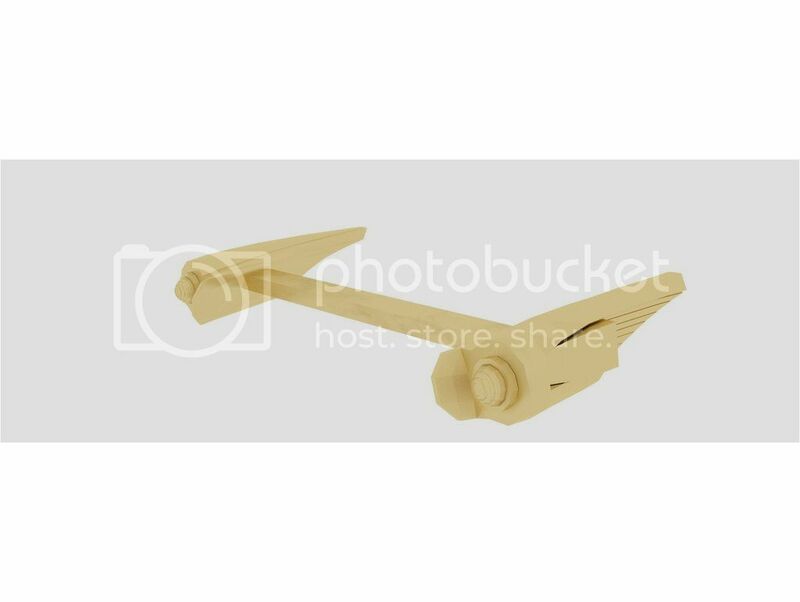 The shift boot was made from progressively smaller rings and are on the shaft made from a headed pin. The dash wood has been chosen .. using the upper one in the Photo. This is a photo of some wood veneer that Hugh Grubb (Kit Basher) sent me and was photographed and a mask of the resin dash with gages and shape applied. I tried a print on photo paper and that will be cut out and glued to the dash. The glove box outline is in Photoshop in black and will be applied before making the final print. The shift receiving piece on top of the tunnel was glued to the console face and now drying and I can finish shaping it tomorrow .. letting styrene glue dry a day and I'll add some surer glue to reinforce to the back. This is a drop in dash/console now! 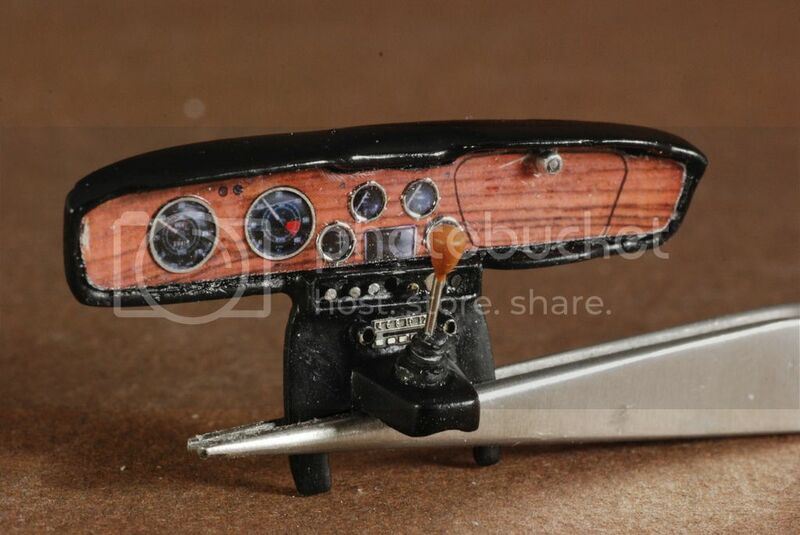 I am loving your work, making a model of a car you've owned is a real labour of love. 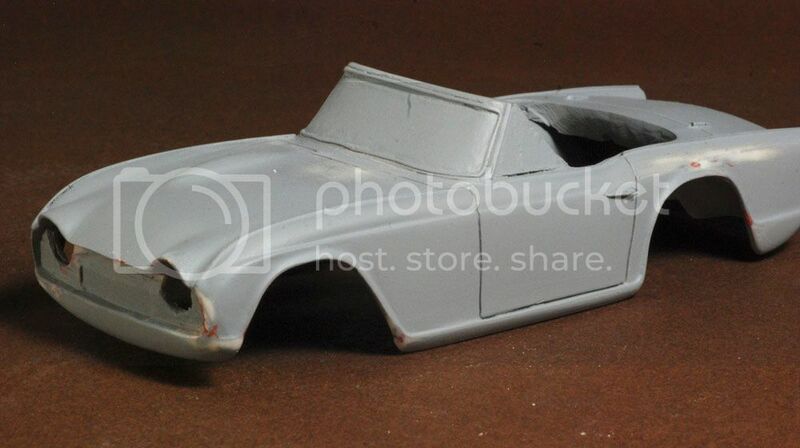 Inspired to get back to my 1/24 model of my 1/1 MGB GT I had before the banks ruined everything! Great job so far! This is definitely an interesting project! I'll be following along. The dash is pretty much done. I've been working on getting the wheels positioned in the wells ... it's been tint adjustment after tiny ajustment but is coming together. 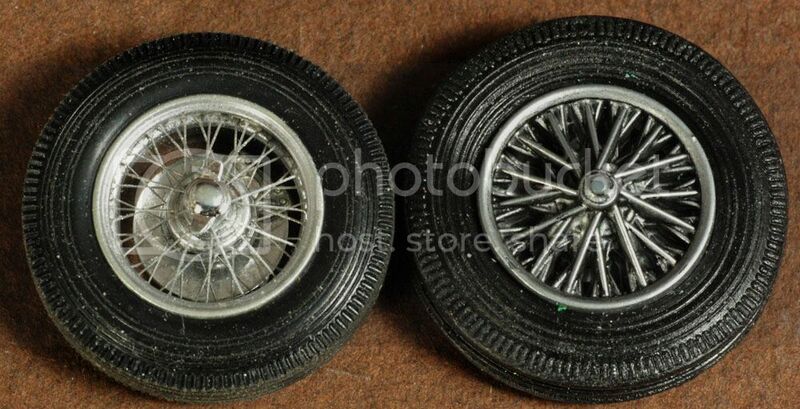 The PE wire wheels I found are from the Gunze Sangyo Triumph TR2 High-Tech model. This is a very interesting project, lots of work but its really getting there! 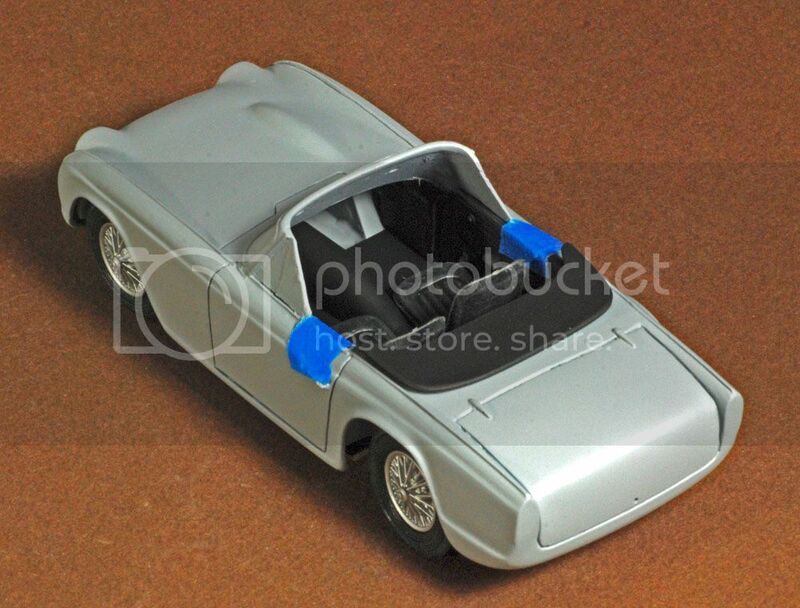 I have an AirTrax VW Karmann Ghia Type 3 (Euro Ghia) body that one of these days I have to buckle down and attempt to fit to the Tamiya Ghia kit. Its much newer and in better shape than yours, but its still going to present its challenges. 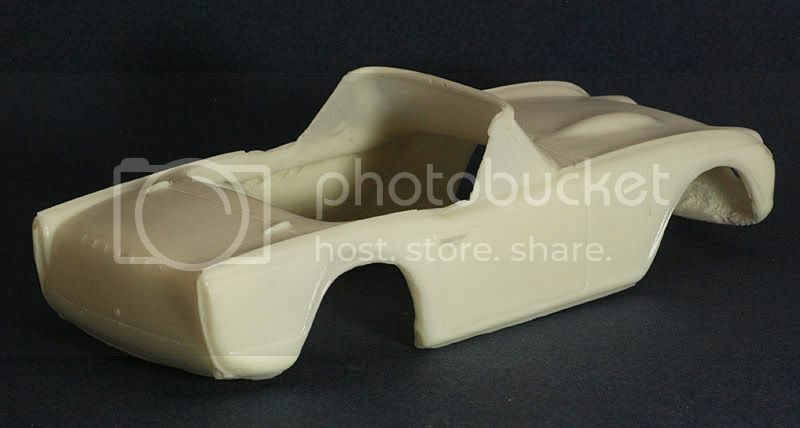 The body, while much thinner than yours was, is very uneven to the point of resin being a mere skin in places (almost actual 1/24 scale sheet metal) and most edges are very rough. Still, your work is inspiring to me, maybe one of these days. Are you still looking for a tonneau cover? if so what dimensions? Might have something around to donate, i have a number of old gunze kits that i have pirated stuff from. Those wheels look great too, i was going to suggest looking into Southeast Finecast but the Gunze ones look excellent. Great work, i encourage you to forge on! and, thanks for the tonneau cover offer but I got it all worked out .. made one with sheet. 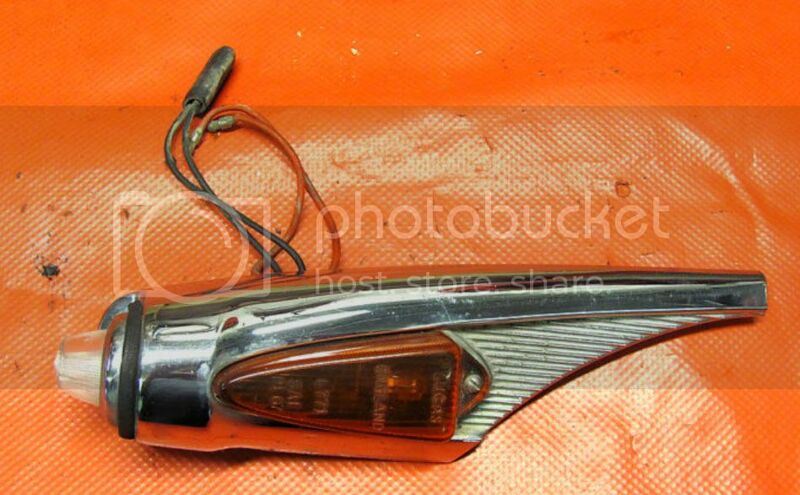 This has leaped to the front as I have solved, presumptively, the creation of the front turn signals. 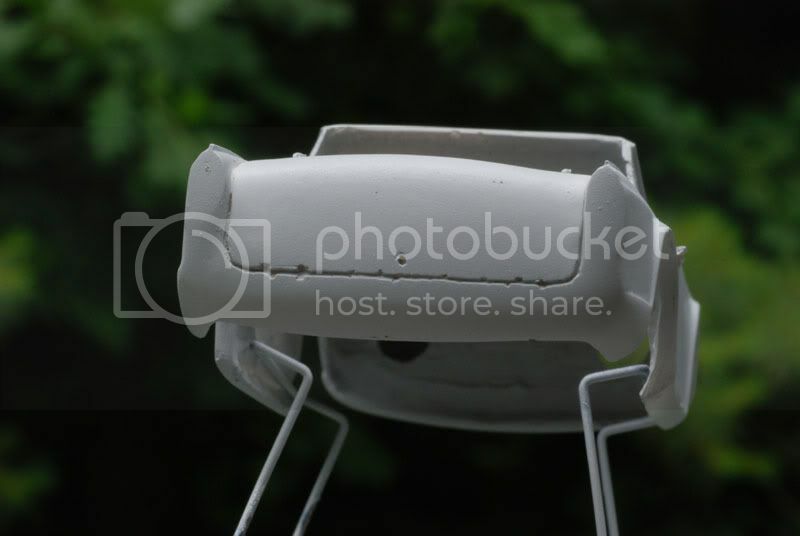 I sent a 3D file to Shapeways for 3D Printing! It should arrive here tomorrow to see how it came out. I knew 3D Printing would find a place in our hobby but never so quickly. I have a little advantage having started the creation 3D Meshes over 20 years ago, actually replacing plastic modeling for awhile. This is all things coming together as I found no way at this point to make these parts. 3D printing them is almost TOO easy! This is a render of what I sent to be printed. I put the bar between them to make it one part (very important) and also gives a handle to paint and chrome them. 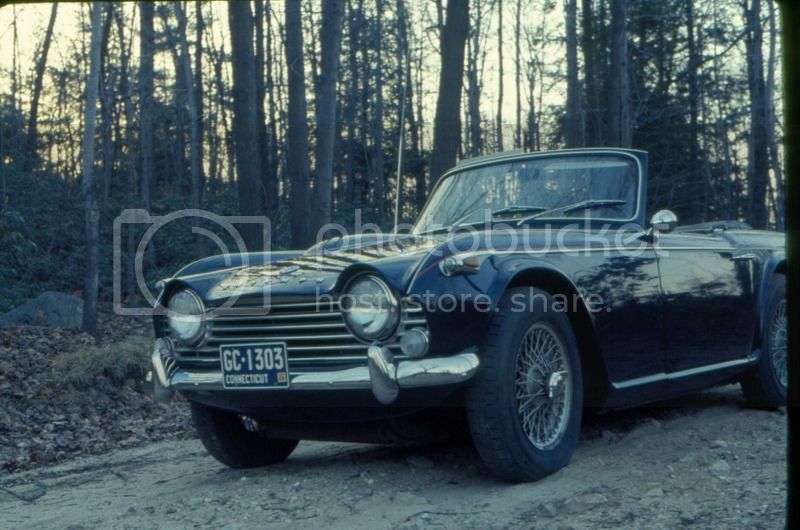 I had a '66 TR4A. Loved that car. Sure wish I hadn't sold it. Very seldom see them anymore. I didn't know there was a 1/24th kit for it. I just might have to try and find one. 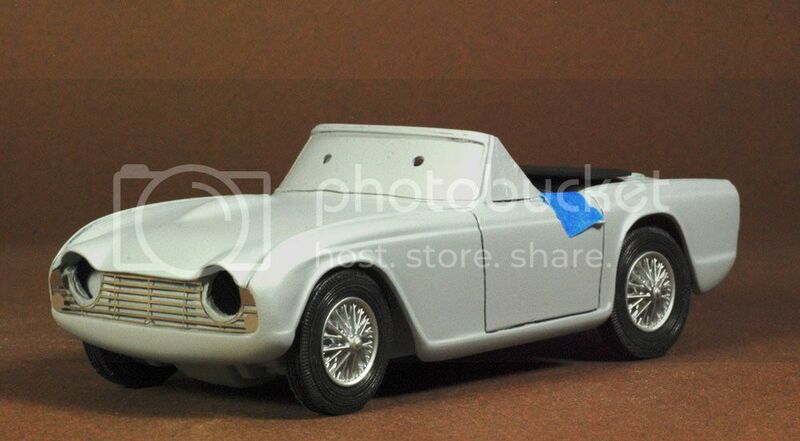 This is a resin kit by AirTrax that needs one of the TR3 kits as a donor. Sorry. I never took a photo of all the parts. 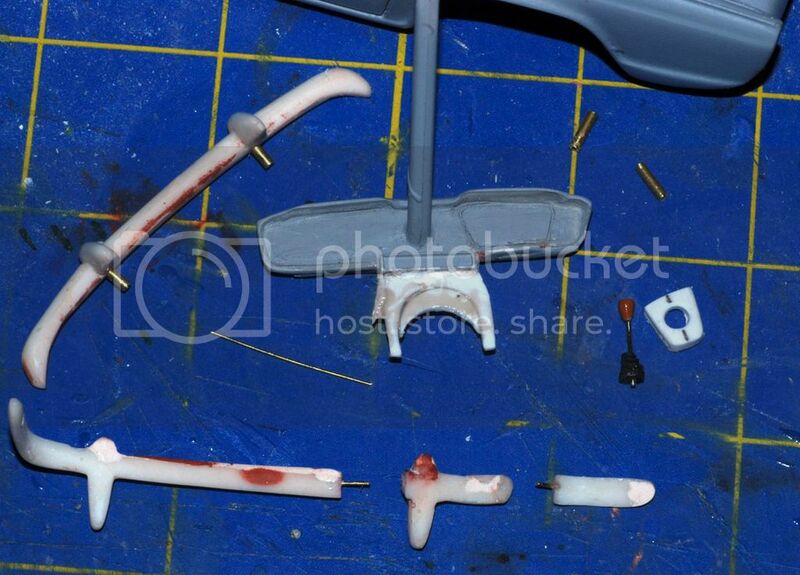 There are some photos here fo some of their resin kits. I received the turn signals and am very happy with them. There's just no way I could duplicate what I have now. They needed a little sanding but just some swipes with some 600 paper. I found I have to sand the body where the seam on the resin body runs too far foward through the area the turn signal has to mount. It will look much better once this is done. 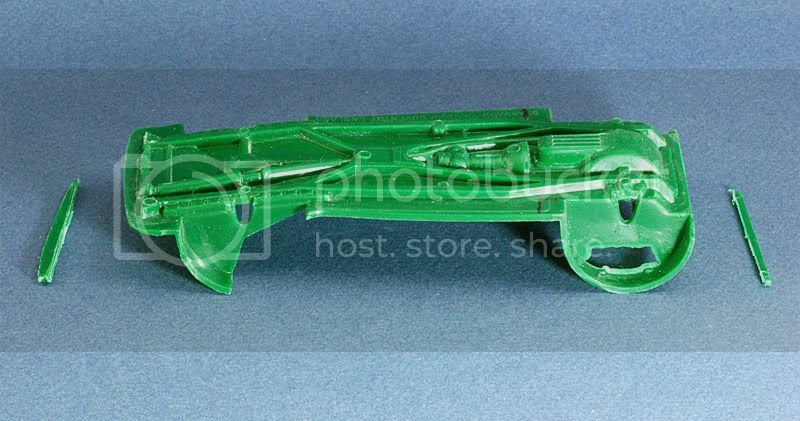 Very nice work,I have the Airfix boxing of the Gunze kit and iit is nice with a P.E. chassis! th 2nd pic shows it alongside a Minicraft TR3A chassis - diff kettle of fish. Those Hi-Tech kits are pretty cool .. I'd love to see how that PE chassis builds up. The wire wheels I have came from a Hi-Tech Gunze TR2 ... they are spectacular wires! Will let you know when I do it - no imediate plans though,the Airfix boxing has white metal spokes which are frankly poop! A PE frame is very interesting, think you'llever build it? 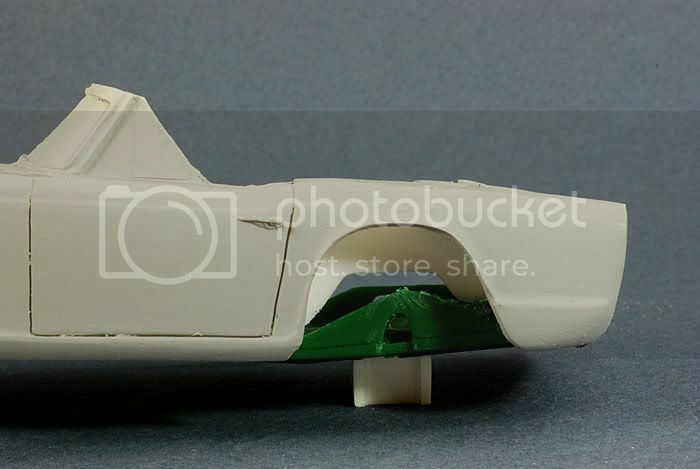 I just started trying to locate the wheels from this kit, also in the low tech kit. I've been looking for rins with circular holes around the rim for a build of my '69 VW with custom rims I bought. These are the closest I've seen. That's a nice first car! I have that Airfix 4A and it would make a pretty nice model, even has an engine, though only 4 cylinders. 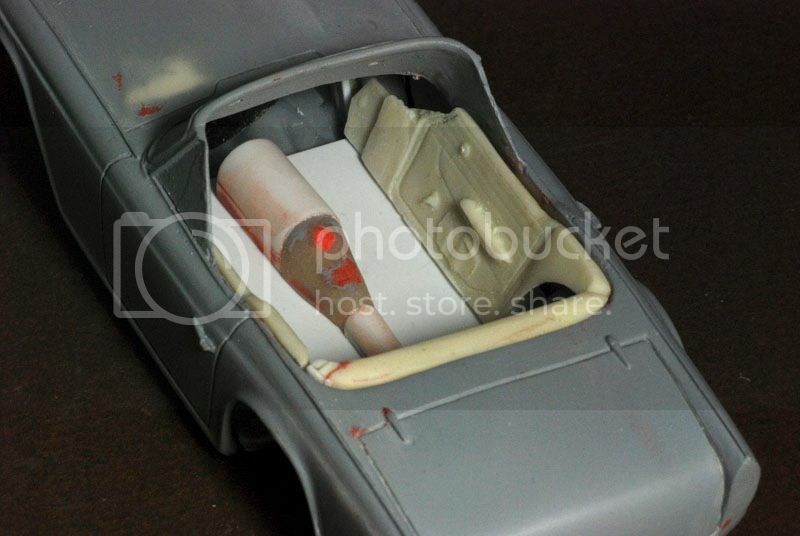 The PE set came with the Air-Trax TR4 resin kit and is 1/24 scale, but you would be welcome to it. 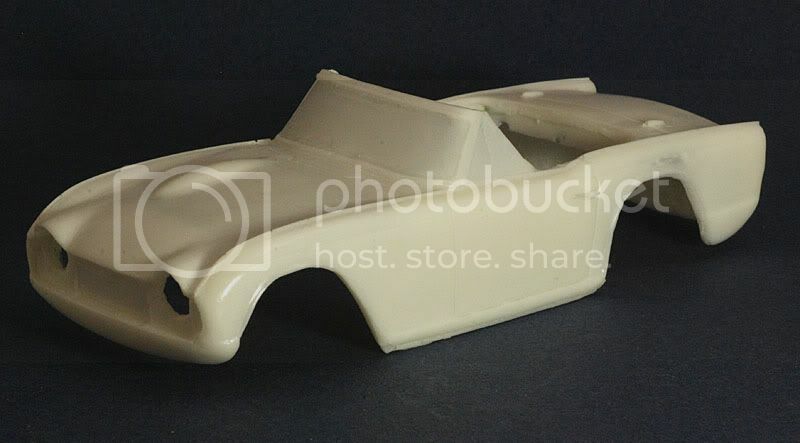 I looked pretty long and hard for a 1/24 TR4 and this was the only option. It does take a lot of work, though I tend to get too detailed. As far as I know there are no diecasts either. The one thing I hated avout the car was having to tune and syncronize everything too much. Was the 250 the same? Cool build and an intersting WIP post. I have an interest in old sport cars and sport car racing. I have aquires several kits and plan on building them in the near futue. Thanks for sharing. 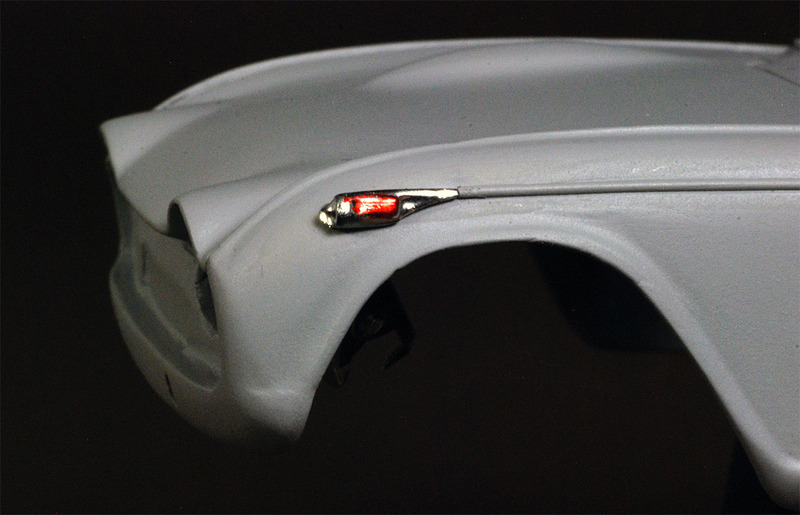 The 3D printed turn signals look great with some Molotow Chrome on them. 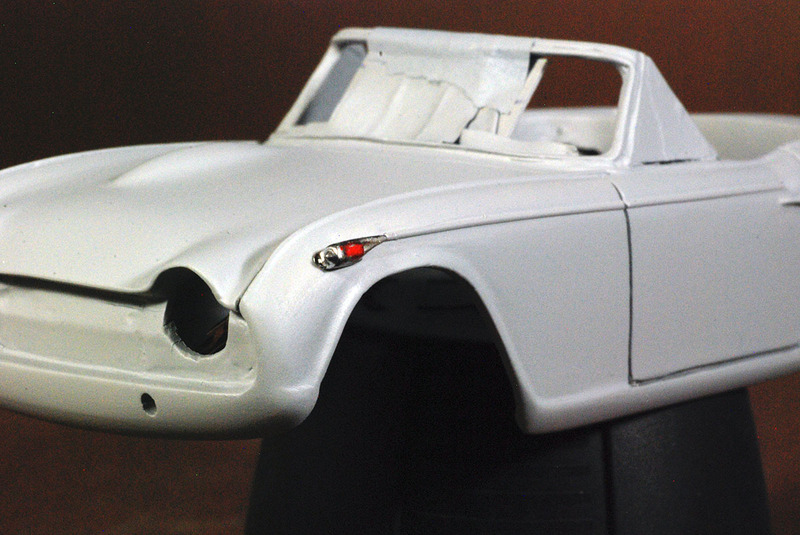 The body is done except for a hole or two for mirror and tailights. There's a bunch of detailing to do now ... mirrors, tailights, grilllights, steering wheel, interior fixtures and chassis detailing.